TheInsuranceBill | Is this a claim? Talk to your neighbor, always better to play nice. Is it a claim? Well a tree from your property fell through your neighbors fence during a storm. Did you do anything negligent? NO, so that just means there should be no lawsuit. So this is my tree, will I get paid for the clean up? In all likelihood it is a double no. 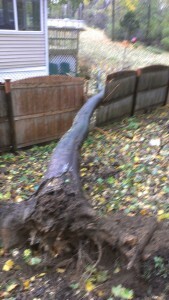 This tree should cost well less of my $1000 deductible to clean up and it also did not hit a covered structure of MINE. Will my neighbor have coverage? Well a tree hit his covered structure(assuming he has home insurance and other structures) BUT this might be a $200 length of fence and I am guessing $200-$400 to cut up. I am hopeful even if he has a $500 deductible his agent is smart enough to tell him not to put this silly claim on his record and if he has $1000 it is likely less than his deductible. But hey it missed his deck and somebody will get some great firewood so it is not all bad right? Just some ideas, use at your discretion. Sometimes it is better to open a claim and go unpaid than to find out later. Either way, your decision. This entry was posted in claims, Deductibles, rates. Bookmark the permalink.